National Fatherhood Initiative annouces the release of an updated version of InsideOut Dad®, the nation’s only evidence-based program designed specifically for incarcerated fathers. NFI’s team of fatherhood experts incorporated practitioner feedback and evaluation data from around the country to refresh the program, which is already standardized programming in 24 states and New York City. InsideOut Dad® Second Edition is designed to reduce recidivism rates by reconnecting incarcerated fathers to their families, providing the motivation inmate fathers need to get out and stay out. For example, a three-year study by the Indiana Department of Corrections found that fatherhood programs such as InsideOut Dad® were linked to prisoner return rates of less than 20%, compared to a national rate of nearly 38%. These reductions in recidivism can lead to enormous cost savings for taxpayers and the criminal justice system. Nationally, the annual cost of incarceration per inmate is between $25,000 and $40,000. The cost to take an incarcerated father through the InsideOut Dad® program could be as little as $40. Used by both inmates and ex-offenders, InsideOut Dad® has been proven, through an extensive evaluation by Rutgers University, to improve inmate knowledge and attitudes. Hundreds of state and federal facilities, pre-release programs, community organizations, and more are using this life-changing reentry program. Facilities such as Angola State Prison in Louisiana, the Rikers Island complex in New York, and U.S. Penitentiary Leavenworth in Kansas are among the notable facilities that have run the program for inmate fathers. Through practical, engaging material delivered in 12 core sessions and 4 optional sessions, InsideOut Dad® increases inmates' self-worth and gives them valuable relationship skills. It covers topics such as Being a Man, Co-Parenting and Communication, Men’s Health, and Children’s Growth and Discipline. National Fatherhood Initiative started working with incarcerated fathers in 1999, leading to the release of the first edition of InsideOut Dad® in 2004. Through its use in over 400 correctional facilities over the years, NFI’s fatherhood experts gathered user feedback to create the second edition, a more content-rich, user-friendly, and engaging curriculum for fathers, which now includes video and other activities to maximize its impact. 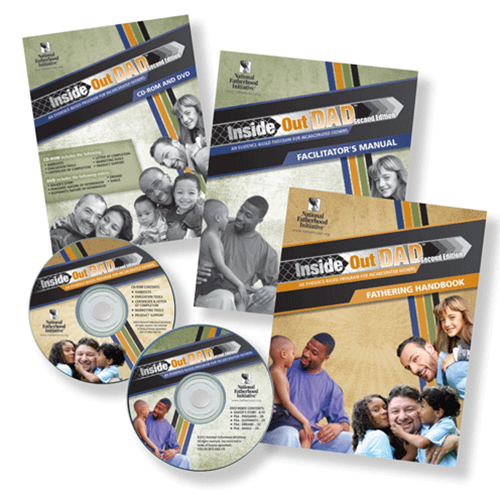 More information on InsideOut Dad® Second Edition can be found at fathersource.org.